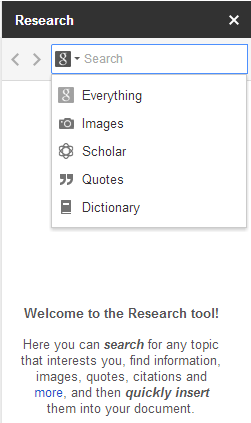 The Google Research tool is a newer feature in Google Drive that might just have gone unnoticed by many users. When activated while in Documents or Presentations, the Research tool opens in the right-hand portion of your Document or Presentation (remains there allowing you to continue to work) until you close the tool. Research allows a user to seamlessly add information, images, videos, quotes, article citations, maps, or personal Drive files directly into your work. One can even define terms within the tool using the Dictionary function. All of these options are available in a drop-down menu to the left of the search box. I like the educational implications of the tool in that Google Scholar is built-in and allows for students to use more research-based evidence in their work. With the citation feature of Google Scholar, students can even take the next step of automatically inserting a citation for their evidence. The New Common Core State Standards are going to require students to locate research-based evidence, incorporate it in their writing and cite their evidence. Why not use this tool, which will help them do all three!? Try it out today. Use the keyboard shortcut (Ctrl + ⌘ + Shift + I on a Mac, Ctrl + Alt + Shift + I on a PC). Watch this video for a short demonstration.